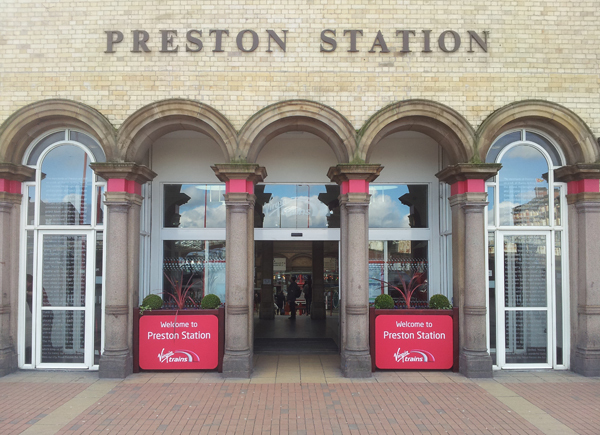 I was commissioned by Susan Howarth of Virgin Trains to design and build four planters to stand in the main entrance of Preston Station. This was part of a face lift of the station by Virgin who hold the West Coast line franchise. I took the Virgin logo, with its roundel as a starting point and continued the rounded theme with the edges of the frame and the centre panels which also echoed the appearence of train windows. Unusually the panels, cut from 18 millimetre marine ply, were located floating away from the frame rather than inserted into a trenched groove. The planters liners were of metal construction. Susan Howarth was extremely pleased with the result and supplied the photograph of the planters in place.